Put time tracking on the map with GPS precision. Know exactly who’s working and where at any point of the day. Who’s Working could change the way you run your business forever. When your employees are clocked in, you’ll know exactly how long they’ve been at work and see everyone’s location pinned to a single map. Every TSheets account comes with this incredible workforce management tool built-in as standard. 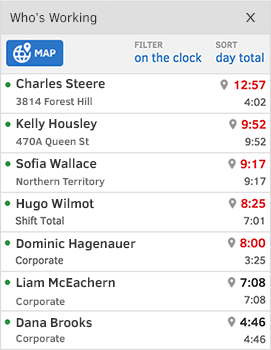 It’s a huge time and resource saver that gives you an instant picture of who’s on the clock, where they are, and how long they’ve been at work. Sort by hours worked, clock-in time, name, or location for an in-depth, real-time snapshot of your business at any point of the day. 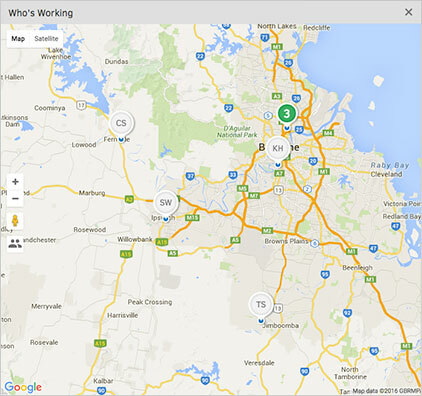 Pin GPS data to every mobile timesheet for unbeatable efficiency. Back at your desk it can be impossible to know who’s on the clock and where they are—especially when your team is always on the move or working on several sites. But not anymore! Just open the Who’s Working window of your TSheets web dashboard or mobile app, and you’ll get the complete picture right away. Start times, hours worked, GPS locations; everything you need to make the best use of your most valuable resource. Eliminate the stress of understaffing and the frustration of not knowing who’s available. With Who’s Working in front of you, you’ll always know who’s at work and where it’s taken them. Learn more about how TSheets’ GPS tracking works. Build trust in the workplace with complete transparency. Gone are the days of wondering what your team is doing right now. You’ll be going home every night knowing exactly where they’ve been working and how long they were at it. This new level of transparency is good for employees too. Everyone can find out who’s on the clock at any point of the day, and managers will always be able to find their teams whenever they need them. Respond at lightspeed with instant job scheduling. When urgent jobs come flying in, you need to know who can take them and how quickly your employees can get there. Urgent leak to fix? A customer who needs an estimate ASAP? No problem. Who’s Working will tell you immediately which employee is closest to the job! And now, with TSheets Scheduling, you can add the job to their work schedule instantly. 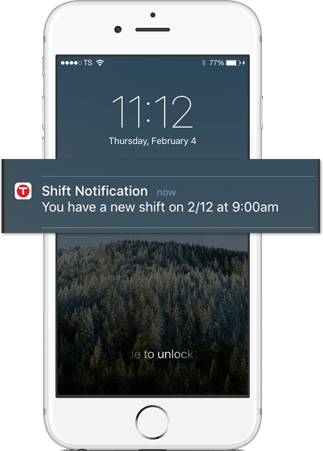 Everything gets sent straight to the TSheets app on your employee’s phone, so they know exactly where they’re needed, when, and what’s required. Your customers and staff will love it, and you’ll be two steps ahead of the competition every time. In an emergency, it pays to know everyone’s accounted for. It’s important to know where your employees are for their own sake as well as yours. For tradies and other service-based industries, the job site can be a dangerous place. With Who’s Working on your screen, you’ll never be in any doubt about who’s on site today. And when they’ve clocked in from a smartphone, you’ll have their exact location too. Zoom into the map and watch clusters of employees expand into individual pinpoints for each person. Zoom back out and the clusters collapse back into groups showing exactly how many people are clocked in at each location—no matter where they are in the world!